يقع فندق نوفوتيل بريسبان إيربورت في مطار بريسبان, بريسبان, هو خيار شائع بين المسافرين. يمكن من هنا للضيوف الاستمتاع بسهولة الوصول إلى كل ما تقدمه هذه المدينة النابضة بالحياة. يقع هذا الفندق الحديث على مسافة قريبة من المعالم السياحية الشهيرة كمثل Direct Factory Outlets, DFO Brisbane Airport Shopping Center, Burnett Meat Co.
. إن الخدمات الممتازة وحسن الضيافة العالي في فندق نوفوتيل بريسبان إيربورت تجعل إقامتك تجربة لا تنسى. يقدم الفندق خدمة الغرف على مدار الساعة, مكتب الاستقبال على مدار الساعة, مرافق مخصصة لذوي الاحتياجات الخاصة, تسجيل وصول/خروج سريع, تخزين الأمتعة لضمان الراحة القصوى لضيوفه. بالإضافة لهذا,تتضمن كل غرف الضيوف مجموعة واسعة من وسائل الراحة . بعض الغرف توفر حتى تلفزيون بشاشة مسطحة, اتصال لاسلكي بشبكة الإنترنت (مجاني), غرف لغير المدخنين, مكيف هواء, تدفئة لإرضاء أكثر الضيوف تطلباً. يقدم الفندق مجموعة رائعة من الخدمات كمثل مركز للياقة البدنية, ساونا, مسار جولف - ضمن 3 كم, حمام سباحة خارجي, تدليك، لجعل إقامتك تجربة لا تنسى. إن فندق نوفوتيل بريسبان إيربورت هو خيارك لخدمة الفنادق الراقية في بريسبان. We booked this through Agoda for an early morning flight out of the international airport. For this purpose it suited perfectly. 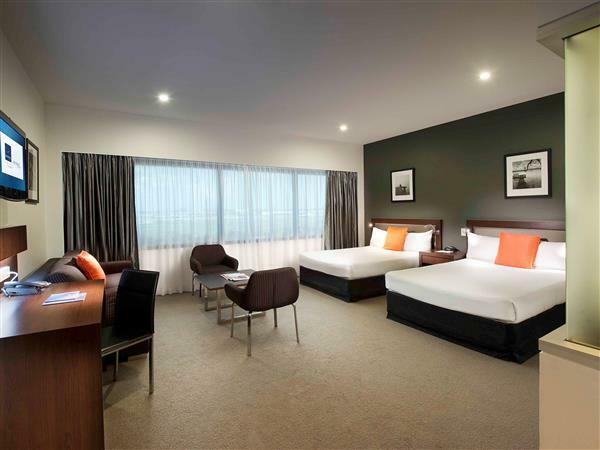 Agoda were significantly cheaper than the Accor direct price (phoned to see if they would match) and they also price matched themselves when they dropped the price again a week after I booked (at the no-cancellation cheapest price…came to $AU154 for a night, 2 adults 2 kids). The family room (2 x Queen) is a bit of a weird layout with a glass door into the bathroom as well as a glass corner to the bathroom so that you can see whoever is in the bathroom as well as get woken by the light if someone uses the room in the middle of the night. The kids would also have preferred there own beds. The staff were all friendly and welcoming and the hotel has a large pool on the roof – towels provided. The food outlets near the DFO closed earlier (5:30 – 6pm) than we had expected but we still managed to find something for dinner. Uber to airport $12 within 5 min at 5am. Staff were great which is what we needed after a long day of travel with a two year old. Brought us up some milk for my daughters bottle & helped with booking shuttle. Room service salads were amazing and fast. Shuttle drivers were both lovely & took us to and from the airport safely. Thanks very much for making everything so easy! Hotel rooms are nice, clean, modern & comfortable. On our recent visit the only issue was I wasn't told at check-in that the hotel wi-fi guest was free for the 1st hour & chargeable after that. We were caught out as we thought the hotel wi-fi was free. Close to the airport. Enjoyed the short distance from airport as landed late at night. Comfortable beds / room, spacious. No spirits in mini bar though. Good and helpful staff. Great breakfast selection and tasty. Rooms a bit dusty. 24hr room service helpful. Thanks! Thank you hotel staffs. Am pleased with your great service and hospitality. You made our stay comfortable. Special thanks to the porters. Loved this peaceful location! Near to DFO and woolworths is just opp! We didnt have our dinner here and drove out town. Staff are very polite and efficient in handling our check in and out. Good for me especially we have a child and super early flight out. The lamb was amazing and the steak. Minimal vegetables but that was to make you buy a side. Easy to get to with the bus dropping you at sky gate. The internet deal is a bit rough. I couldn't download all my emails as you only had 100mg. I had been of the grid for a relaxing week and wanted to download my work emails to read on the plane and didn't have enough to download. 100mg in this day and age. I chose the hotel as I had an early-morning flight to Singapore. Check-in was fine, room was quiet and comfortable, dinner in ground-floor restaurant very good, and wake-up call came on time. The AU$5.00 charge for the airport transfer is a somewhat unpleasant and unnecessary surprise. 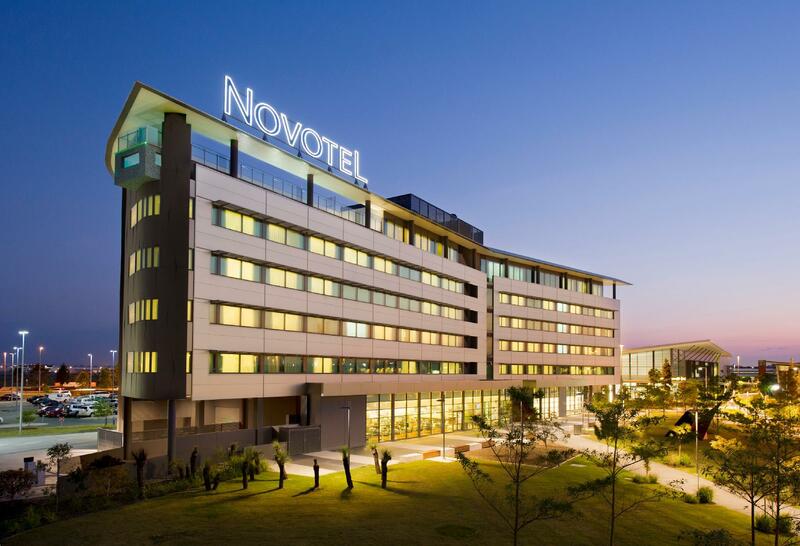 Short 1 night stay, this hotel is about 5-10 minutes driver from airport, there's free skygate bus from both international and domestic airport, stop at Skygate building next to Novotel, hotel is also providing airport transfer at 5 dollars per trip per person. Friendly staffs is a bonus, room is relative good size and clean, next to a factory outlet as well, overall is not a bad option of airport hotel. Restaurant available until 10pm. DFO eateries, coffee shops just across road. Close to international and domestic airports. Offer a shuttle service to airport all times for low price. The staff at Novotel were so friendly and helpful. And it’s great to be so near to the airport and 24 hour Wookiee. There are no toothbrushes, combs etc provided which was annoying as we had ours packed away for the flight. However there was shampoo, conditioner and body wash FYI. I have stayed here a few times, but it's expensive for what you get. The rooms are ok, but clean. The breakfast is also ok, but not great, just ok. We were charged $25 for parking underneath the hotel, which I really took exception to, as it's not as if you are in the city, and there is simply no where else to park, so that adds a very unnecessary $25 to the cost of your stay. It's altogether too expensive now, as they didn't used to charge for parking. I won't stay here again for this reason. It's overpriced for what you get. I've stayed in better Novotel hotels. 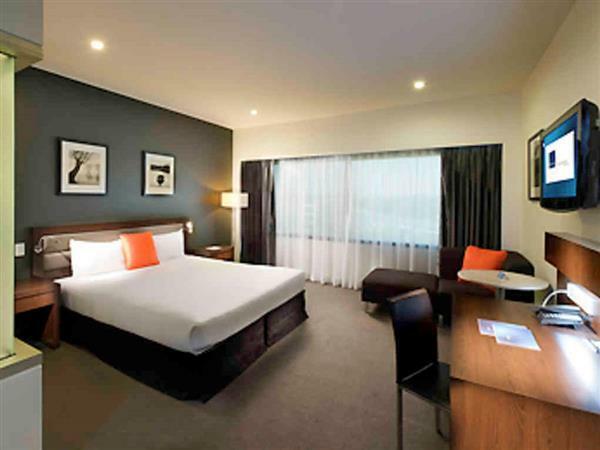 Brisbane Airport Novotel is a bit lacking, but still expensive. Nice clean rooms, very helpful staff wouldn’t book anywhere else. 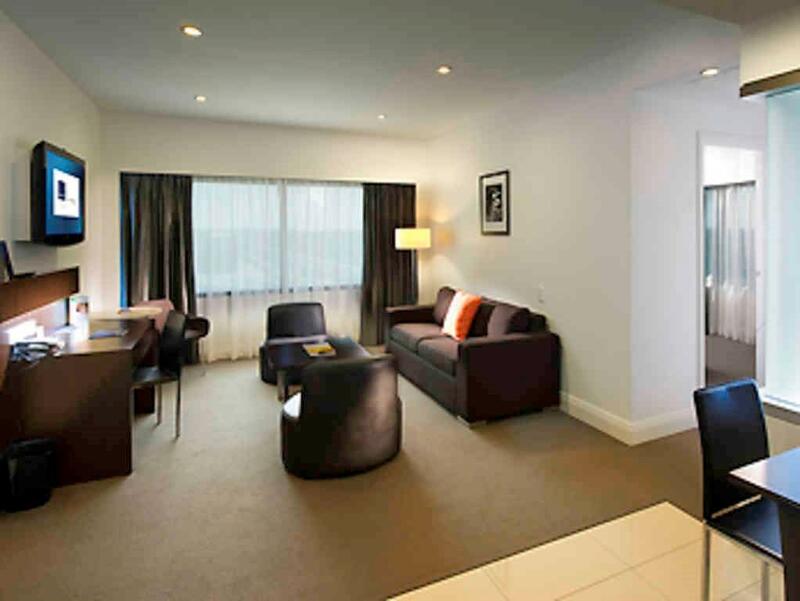 This hotel is clean and modern and offers reasonable service with regular airport transfers. It is not outstanding but provides an acceptable level of hospitality and cleanliness considering the prices paid. Not really value for money overall. Pros: clean CONS: We booked a standard king room, and we're given a room for the disabled. No standard shower. We placed the Do Not disturb sign on the door and cleaning lady knocked with the words (oh I didn't see the sign) hanging on the door!!! Then to add insult to injury, a few minutes later the adjoining door to through from the room next door opened - words were " oh I thought you'd gone. Perhaps knocking to see woukd have been in order. Staff training shocking!!! !